The Dino's are back at the ROM! 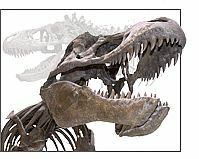 Click here to enter the ROM's website to find out more about the dinosaurs. 85 feet long with a whip-like tail and 15 tonnes of weight that could crush a car. Yet all it wants for dinner is a juicy plant. But don’t misunderstand him. Just because he’s a vegan, doesn’t mean he’s a pushover. The ROM’s huge Barosaurus skeleton was recently re-discovered in our own vaults. Dating to about 150 million years ago and collected from what is now Dinosaur National Monument, Utah, in the early part of the 20th century, the skeleton was acquired by the ROM in 1962 through a trade with the Carnegie Museum. The pieces were dispersed around the collection room due to various moves, and it was forgotten that all the pieces were from the same animal. ROM curator David Evans re-discovered the specimen after reading some recently published literature referring to the specimen and he traced it back to the ROM’s collection. When all the parts were placed together, the ROM realized it had the better part of a skeleton of a rare, giant dinosaur. This is the only real sauropod skeleton to be mounted in Canada, the largest dinosaur skeleton on display in Canada, and the only real fossil Barosaurus mounted in the world. When alive, the animal would have weighed about 15 tonnes (15,000 kgs). 8 tonnes of pure muscle. 60 razor-sharp serrated teeth. A bite force that could cut through bone like you do a powdered doughnut. Quite simply the most formidable predator the Earth has ever known. Tyrannosaurus rex, which means "Tyrant Lizard King", was a huge meat-eating dinosaur found in western North America in rocks from the end of the Cretaceous period, about 68 million to 65 million years old. T. rex walked on its two hind legs, while the function of its tiny but powerful arms remains uncertain. Tyrannosaurus rex was among the largest known of the meat-eaters. Its eyes faced forward, giving it stereoscopic vision. The structure of its jaw allowed all the teeth to engage at once when biting. To support its massive head, its body and neck were short and deep compared with other carnivorous dinosaurs. The tail was long to balance the body and head. Many of its massive bones were hollow, which reduced the weight of the skeleton while still providing strength. T. rex was among the last dinosaurs to exist prior to the Cretaceous-Tertiary (K/T) extinction event. Hadrosaurs, or ‘duck-billed’ dinosaurs as they’re more popularly known, were the most common type of dinosaur in North America during the Cretaceous period, but don’t tell them that. With unusual features such as crested heads and hundreds of cheek teeth, they’re anything but average. And they don’t look a day over 65 million. Hadrosaurs lived during the late Cretaceous period from about 80 million to 65 million years ago. These herbivores often had crested heads and ranged in length from 20 to 40 feet long and 14 feet high. The ROM is known for its large and varied collection of hadrosaur specimens, including a Maiasaura (meaning ‘good mother lizard’). Unlike many other herbivorous dinosaurs, hadrosaurs had no obvious protection from attack by carnivores. Some species probably relied on herding behaviour, good eyesight, sense of smell and large size to avoid predation.